Not only was this designed to be a lust-worthy launch day lens for the EOS R, it was envisioned as a demonstration for what the new RF mount is capable of. The price tag is tear-inducing, but mount this fantastic lens on the EOS R and even the most vocal naysayer will be a believer in what Canon is trying to achieve with the system. The Canon RF 50mm f/1.2L USM lens is a new premium lens designed specifically for the new mirrorless Canon EOS R and EOS RP camera. Complementing the RF 24-105mm f/4L IS USM as the EOS R's launch day lenses, it has been designed from the ground up to take full advantage of the new RF mount and showcase exactly what is possible with the shorter back focus distance (from lens to flange) of just 20mm. Costing 175% more and weighing in 163% heavier than its predecessor, the EF 50mm f/1.2L, you might wonder if the new RF iteration is worth the financial layout – particularly when you get seamless performance of EF lenses thanks to the bundled Mount Adapter EF-EOS. In short, if you can stomach the price, it absolutely is. This lens was engineered to take the L series to another level and it realises the full potential of the EOS R system. The new customisable Control ring is a real difference maker, offering fingertip manipulation of a variety of settings right from the barrel. It can be programmed to control aperture, shutter, ISO and white balance, either by turning the ring alone or by first depressing the Meter button (to avoid errant turns). It should be noted, mainly for the benefit of videographers, that the Control ring isn't clickless. The manual focus ring is electronic, but is well damped and feels both precise and pleasingly tactile, with enough throw to feel fairly faithful to a traditional manual lens. The autofocus is very snappy, even under extreme low light conditions (thanks to the EOS R’s -6EV capability), thanks to the new mount with its 12-pin contacts. This is especially impressive, given the size of the elements that are being shifted around. While we found the RF 50mm f/1.2L to deliver near-flawless results in practical shooting situations, it also performed admirably in our lab testing. The new RF mount 50mm delivers great sharpness wide open at f/1.2 and right the way up to f/11, and maintains impressive edge sharpness, too. Fringing isn't something you need to worry about when shooting with this lens, as it’s practically non-existent. Chromatic aberration simply isn't a concern here. As for distortion… what distortion? Prime glass and an optimal-standard focal length successfully eliminate virtually any trace of it. Throw in weather sealing and this lens more than lives up to its L series lineage. It's usual for a lens to be this sharp at such a large maximum aperture, but the new RF-mount 50mm delivers great results right up to f/11, and maintains impressive edge sharpness, too. You needn't worry about fringing when shooting with the RF 50mm f/1.2 L USM, as it's practicality non-existent. Distortion? What distortion. Prime glass and an optimal standard focal length successfully eliminate any trace of it. This lens was designed as a system showcase, doing justice to its L series billing as well as the EOS R system. 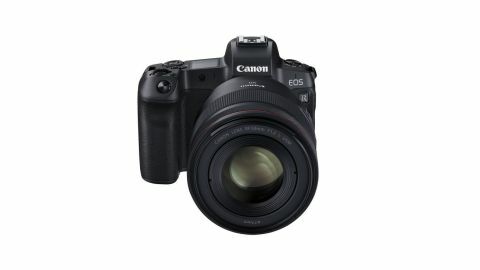 It’s not cheap, costing as much as the camera itself, and given the EOS R's lack of IBIS it would certainly have been nice to have lens-IS. In terms of the results, however, it’s everything you could ask of a fast Canon prime.